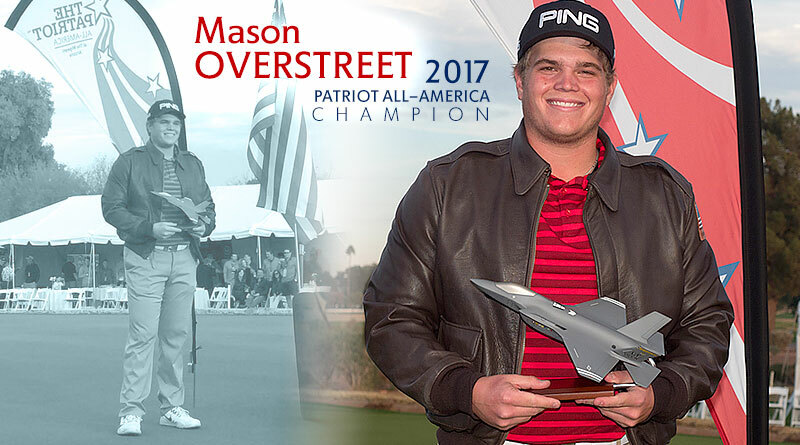 PHOENIX, Ariz. (December 18, 2018) – Caolan Rafferty of Ireland and defending tournament champion Mason Overstreet of Kingfisher lead an impressive field of top collegiate golfers who will play in the 2018 Patriot All-America Invitational presented by the Valley Toyota Dealers. The tournament, considered one of the elite amateur golf events in the country, will be played at The Wigwam Golf Club in Litchfield Park, Ariz., December 29-31. Rafferty, a sophomore at Maynooth University in Kildare, Ireland, and Overstreet, the 2017 Patriot All-America Invitational champion and a junior at Arkansas, lead a field of 84 PING All-America golfers from all three NCAA Divisions, NAIA and NJCAA rankings as well as from U.S. Military Academies and universities outside the United States. Golfers will compete in a 54-hole, stroke-play competition on The Wigwam’s famed Gold Course. Competitive rounds for the 2018 Patriot All-America will be played December 29, 30 and 31 with a champion crowned at approximately 4 PM on New Year’s Eve. What separates the Patriot All-America from other collegiate golf tournaments is participants play for more than themselves or their school. Each golfer honors a fallen or severely injured soldier by carrying a golf bag bearing the name of that soldier. Before the tournament, participants receive a card with the soldier’s story, so they can be familiar with who that person was, what they represented and how they were killed or wounded in action. At the conclusion of the tournament, the golf bags are shipped to players’ schools and auctioned with all proceeds benefitting the Folds of Honor Foundation, which provides post-secondary educational scholarships for children and spouses of military service men and women killed or disabled while in active service. According to the latest World Amateur Golf Ranking, Rafferty (50) is the highest ranked player in the field, with Austin Eckroat from Oklahoma State (61), Overstreet (63), and Noah Goodwin from SMU (67) the other top 70 players to commit. The Men’s World Amateur Golf Ranking system ranks the top male amateur golfers in the world on the basis of their average performance in counting events over a rolling cycle of the previous 104 weeks. Cindy McCain, widow of United States Senator John McCain, businesswoman and philanthropist, will speak at the opening ceremony Dec. 28. Also speaking at the Opening Ceremony will be Folds of Honor Senior Vice President Major Ed Pulido; Luke Air Force Base 56th Fighter Wing Commander, General Todd Canterbury; 2019 Waste Management Phoenix Open Assistant Tournament Chairman, Major Tim Woods; and West Valley Maverick’s President Wade Accomazzo. The Opening Ceremony will be emceed by legendary Valley sportscaster Jeff Munn and will feature the presentation of colors by the Luke Air Force Base Joint Color Guard, the National Anthem performed by U.S. Navy Retired Petty Officer First Class Steven Powell, a United States Air Force F-35 flyover and a United States Air Force Wings of Blue parachute descent. The Patriot All-America is a collaboration between the Arizona Golf Association, JDM Partners, The West Valley Mavericks and the Golf Coaches Association of America in partnership with the Folds of Honor Foundation. The Thunderbirds, hosts of the PGA TOUR’s Waste Management Phoenix Open, volunteer at and support the event. The winner of the Patriot All-America will receive a sponsor exemption into the Web.com Tour’s Wichita Open played June 20 – 23 at Crestview Country Club in Wichita, Kansas. For more information on The Patriot All-America Invitational presented by the Valley Toyota Dealers, visit www.patriotallamerica.com.